Y’all are wonderful. So many people fell for my tall tale of the baby bison, and they were such good sports about it! Things went to a whole new level when my April foolery made the Decatur Metro blog. Suddenly I had an all-time record-breaking number of hits, emails and phone calls from people (some I know, some I have never met!) 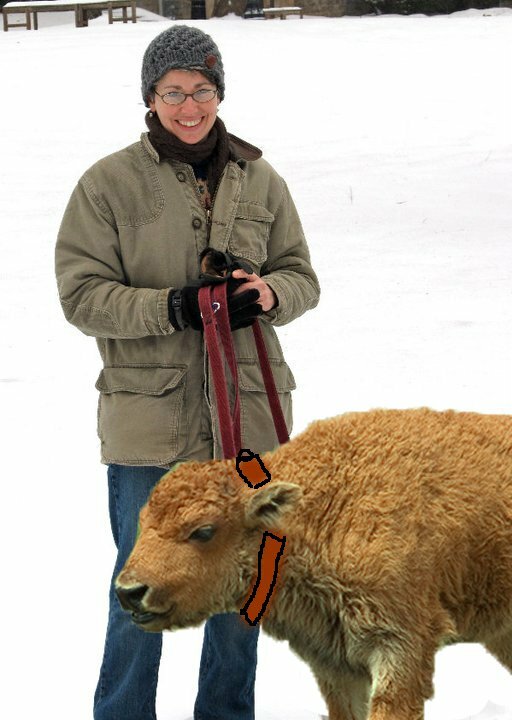 wanting to come and visit my bison, and a few astute folks calling me out on my bad photoshopping (true, that). Then I got a phone call from a local TV news reporter wanting to do a story about my bison. Then John Kessler tweeted about me! Really. The best April 1 ever. Nellie and I thank you. More than a few of us urban homesteaders — women especially — were fanatical readers of the Laura Ingalls Wilder Little House books (and some, maybe, still are). We still harbor fantasies of a pioneer life, setting up our cozy homesteads on some pristine piece of prairie, mastering our survival skills, resting by the hearth after a day of hard work, our bodies and souls strengthened by the intrinsic value of having fed, clothed, and sheltered ourselves and our families. It’s a distinctively American impulse, I think, that pioneer spirit. I recently decided to honor my own inner pioneer by venturing into the next “frontier,” if you will, in urban homesteading. Meet Nellie Oleson, my first baby bison. Nellie arrived on a methane-powered livestock truck from a ranch in Montana. She is a domesticated breed of the American bison, meaning that genetically she has some cow in her. This makes her (and the additional head I will acquire as I gradually grow my herd) easier to manage as livestock — hopefully she won’t knock down the rain barrels, for example, or trample my dog in a stampede. 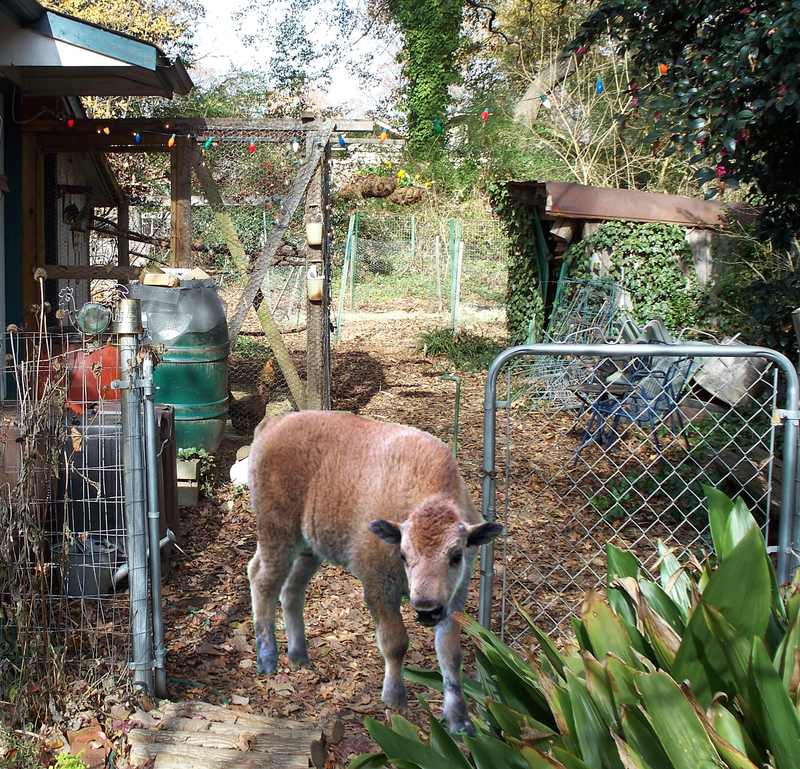 Nellie’s getting lots of good, organic, locally sourced, non-GMO grains at the moment, but soon I’m hoping to free-range her in a large kudzu patch not too far from my house. The walks over there through the neighborhood will be good for both of us, too. I’ve already halter-trained her for a lead. I believe that the bison’s presence in our city signifies a restoration of this land’s once-great biodiversity, not to mention the virtues of homesteading at its most Ma Ingalls authentic. But don’t get too attached. My plan is to raise Nellie to become a protein source, and I’m really looking forward to a nice, thick rug for my own hearthside. In the meantime, the manure is working wonders for my early spring crops. 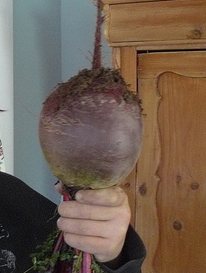 Check out this beet! Slowly but surely, Nellie and Caleb are getting to know one another. Caleb was uncharacteristically timid at first and ran and hid in the hole he’s been digging under this cast-iron plant over the past few years. But Nellie’s good nose soon found him out. 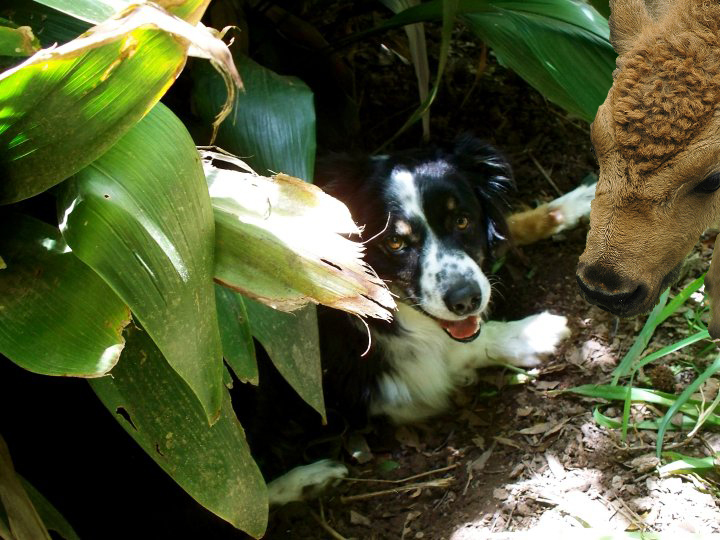 Here she is saying hello and trying to get him to herd her around the backyard a little. I should add that in its typical progressive style, the City of Decatur and its officials have been more than gracious about my endeavors to conquer the next frontier in urban homesteading. I pulled some strings in city government, and the municipal code will soon be changed to accommodate this most American of efforts. Also, I will be teaching a class later this year titled “Where the Buffalo Roam,” for city dwellers who want to get started with bison at home. Look for square-foot ranches to spring up in backyards all around town very soon.